Digital networks are changing all the rules of business. New, scalable, digitally networked business models, like those of Amazon, Google, Uber, and Airbnb, are affecting growth, scale, and profit potential for companies in every industry. But this seismic shift isn’t unique to digital start-ups and tech superstars. Digital transformation is affecting every business sector, and as investor capital, top talent, and customers shift toward network-centric organizations, the performance gap between early and late adopters is widening. Not too many years ago, the idea of a hotel chain that didn’t own a single building or an international taxi service that didn’t own any cars might have seemed ludicrous. Today, of course, we know there are international companies worth billions of dollars in market value whose business model depends on customers connecting with independent suppliers of the service — not on the ownership of physical assets. 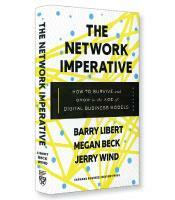 In The Network Imperative, authors Barry Libert, Megan Beck and Jerry Wind describe the scalable, networking-based business model that is revolutionizing industries. Ebay, Uber, TripAdvisor and even Visa are examples of companies built on a network business model. A quick comparison by the authors of market values between traditional and what they call “network firms” is revealing. For example, Hertz boasts a $7 billion market capitalization; Uber’s valuation is listed at more than $70 billion. Other business-performance measures also highlight the value of network firms. For example, the authors identify four different types of business models in the market today: asset builders who deliver value through physical goods; service providers who deliver value through skilled people; technology creators who deliver value through ideas and intellectual property (e.g., software and biotechnology companies); and network orchestrators who deliver value through connectivity. The authors’ research showed that while return on assets stagnated around 4 percent for the three traditional models, return on assets for network orchestrators hovered at 10 percent. The core message of The Network Imperative is that the principles of network orchestrators can and should be adapted to all industries. The authors dedicate a major portion of their book to describing ten networking principles, also described as “strategies for creating network value.” In summary form, the principles are to 1) create digital capabilities; 2) invest in intangible assets; 3) actively allocate your capital; 4) lead through co-creation; 5) invite your customers to co-create; 6) focus on subscriptions, not transactions; 7) embrace the freelance movement; 8) integrate big data; 9) choose leaders who represent your customers; and 10) open your mind to new possibilities. Many familiar themes tied to innovative business models — co-creation, freelance employees and big data, for example — are discussed in these pages. The authors make a compelling case that companies should investigate all the principles and leverage them based on the situations and circumstances of their firms. Following the macro-level discussion of network principles, the authors offer a micro-level five-step formula for implementing network orchestration into a firm. It is through the principles, however, that The Network Imperative offers the greatest value for companies that can start to rethink such issues as governance, HR and the allocation of their capital.